I have a thing for money-making, simple solutions to obvious problems, and GeoSurf sure is one of those. This may come as a surprise to some, but even though it’s 2011, if you’re a media buyer, you pretty much work in the dark. I mean this in the sense of media buyers’ ability to actually see their ads on the properties they bought digital real estate on, as well as the ability to see which advertisers are bidding against them. To tackle this issue—a paradox caused by IP and geo-targeting employed by media professionals themselves—proxies have to be used. These, however, tend to be tricky to use and are often plain unreliable. GeoSurf’s solution fills this void. 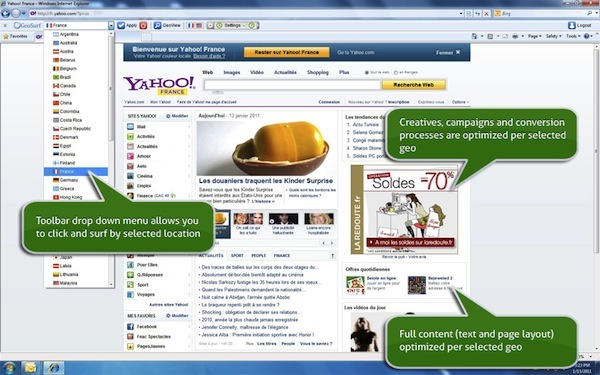 Launched in 2009, GeoSurf provides a browser add-on (IE & Firefox), VPN client and iPhone/Android solution that allows media buyers to view ads and web content with a local perspective in 60 countries and 20 US metros. The range of products is currently used to view who is bidding on ads in a variety on mediums, such as: display, affiliate, video, in-game, in-text, mobile and even desktop applications. If you’re in the media-buying business, the benefits are pretty obvious: new advertisers can be discovered, campaigns can be optimized, better analysis can be performed prior to launching a test campaign, and campaign deployment can be executed in real-time. To make this happen, BI Science, the company behind GeoSurf, deployed a network of servers around the world that runs an infrastructure that dynamically allocates bandwidth based on real-time analysis, historical demand and physical proximity. This allows the company to provide a fast and secure browsing experience for media buyers. Co-founder Cameron Peron explained to me that usage of GeoSurf is dynamically priced depending on consumption and type of channels used. For example, ‘light usage’ (checking ads on PPC or affiliate channels) will be more priced lower than ‘heavy usage’ (performing business intelligence and spot checks over video, in-text or Facebook apps).